Where did time go? I needed to start melting through my fall scents now because it will be holiday melting time before you know it. 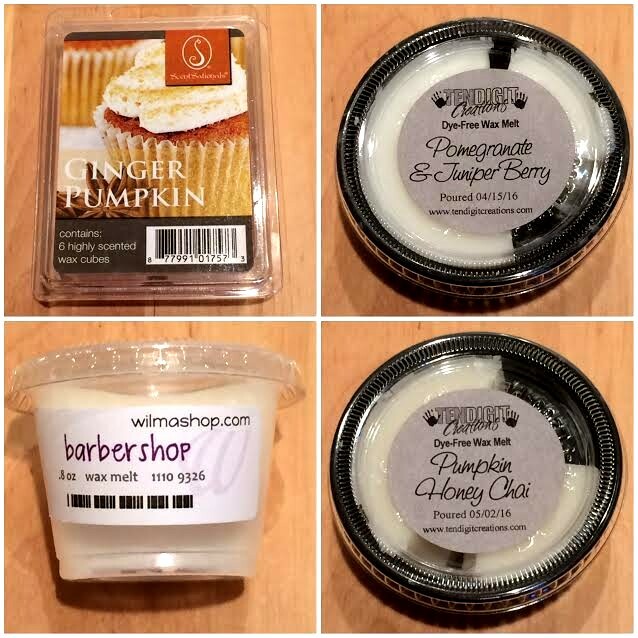 I did get through some fall scents this week and it was overall a fairly good wax week! My Thoughts: This is basically pumpkin spice on steroids. It's a lot spicier than your average pumpkin spice. I detect ginger and a lot more cinnamon. It's a great scent. I really like it. Despite the cupcake photo on the front, I only get a hint of a bakery note going on. It's really just an extra spicy pumpkin spice. My Thoughts: This is more of a holiday scent to me than fall, but that really doesn't matter. It's a very juicy pomegranate note with earthy and airy notes added to it. It's a really nice scent. I'm a fan of fruity wintery scents like this one. The throw was decent, but it faded fairly quickly. Scent Description: The nostalgic fragrance of shaving cream with maybe a touch of aftershave. My Thoughts: The description is right. This smells just like plain shaving creme. It's a soft and very soapy clean scent. There isn't anything really overly strong or masculine about this. It's just shaving cream. I really enjoyed this scent. I'll be needing more. My Thoughts: The description on this one is not right in my opinion. This smells like pumpkin, butter, and salt. An obscene amount of salt. This scent is so salty to me! It's not bad, but it's not anything I really could handle for a long period of time. It's like a pumpkin cookie buried in 4ft of salt. It's weird,don't I dont totally hate it. It just needs to be 90% less salty and 90% more honey and chai. I get the slightest bit of chai from this but no honey at all.